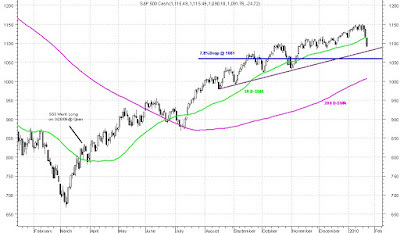 Since March 2009 lows, SPX has corrected twice, dropping 9.1% from its peak in July 2009 and 6.5% in November 2009. This correction is no different from the previous two and I expect a drop of 7.8% (average of the last two) from the recent SPX peak of 1150. That suggests 1061 as the low point for this correction, very likely happening intraday either on Monday or Tuesday next week.